JOIN OUR MARCH CAMPAIGN – WEAR YOUR SUPPORT FOR ANIMALS WITH OUR RAISE UR PAW T-SHIRTS – NOW AVAILABLE FOR A LIMITED TIME. Raise Ur Paw Today... when it comes to the issues and dilemmas that our innocent voiceless face, endure and are subjected to – all help/support is needed, whether being a voice or action taker. Awareness needs to be spread worldwide, in order to save and protect lives. As a Canadian Federally Incorporated Not-For-Profit, we are constantly being asked if we sell t-shirts or any other merchandise for promotion or raising awareness. 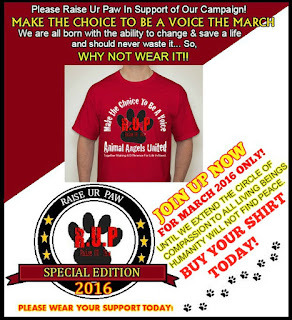 It is due to these requests that we have decided to take the step to bring to the world our very first ever RAISE UR PAW T-SHIRT CAMPAIGN (FOR MARCH ONLY) - Not only to help out our efforts but to use the proceeds to help save/protect innocent life that is continuously crying out for humanity's help and support... because after all, there are countless lives and issues that are going ignored and unheard, and that is something that we as humanity cannot permit to continue on. 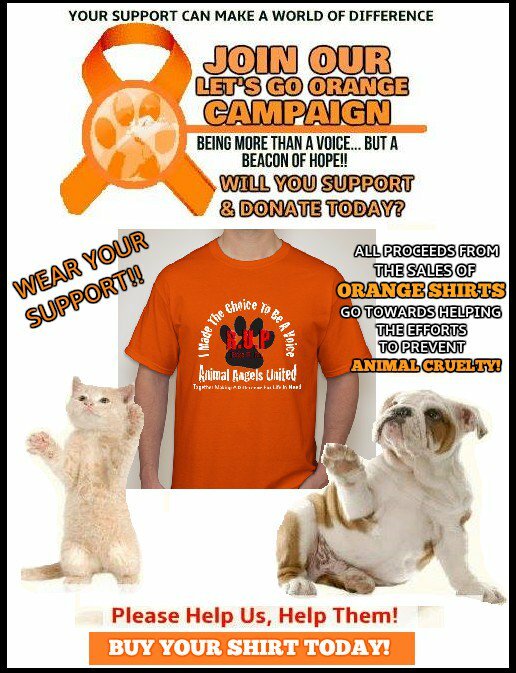 PLEASE PURCHASE YOUR RAISE UR PAW T-SHIRT HERE (Before Time Runs Out) https://www.booster.com/make-a-stand-for-life-animal-angels-united WILL YOU HELP TODAY!! When you purchase one of our LIMITED T-SHIRTS, or make a donation, your contribution not only makes a world of difference, but shows others that you have taken that moment to make a stand and RAISE UR PAW for animals in need worldwide, and proceeds go towards the efforts to make that difference a reality. Wearing one of our limited t-shirts will not only make you "Pawsome" for helping our cause and helping animals in need, but will also show the world that you made the choice to be a voice & will forever make a stand for animals in need. 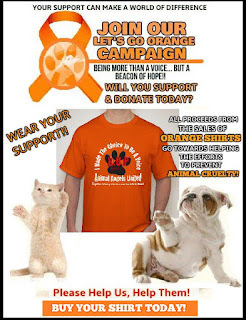 Our T-Shirts not only come in many sizes, but also 4 amazing colors to choose from – including SPECIAL EDITION ORANGE – the color for PREVENTION OF ANIMAL CRUELTY MONTH THIS APRIL. Please HELP US, HELP THEM – We all have the ability to save and change a life.. an ability that we should never waste..so why not WEAR IT, after all they deserve our SUPPORT & HELP.